#HDButtercupStyle just got bigger and better! With 100,000+sq. ft. at the Helms Bakery flagship store, their gorgeous Costa Mesa showroom, the recently opened Santa Monica location inside Fred Segal, and their brand spanking new downtown L.A. digs, H.D. Buttercup is a megastar of style and elegance. And if you’re ever up in NoCal…well, there’s one there too. We are super excited for their expansion and during a recent peek inside the L.A. store, it ‘s easy to see why they remain trendsetters in the design world. From the one-of-a-kind pieces to the unique spin on old-world classics, H.D. Buttercup has a voice all their own. If you haven’t wandered through any of their showrooms lately, come take a look at 2016 #HDButtercupStyle and catch their famous 1/2 Yearly Sale. Great design just got even easier. 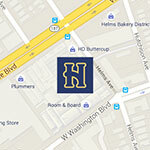 Visit their downtown showroom to see H.D. Buttercup’s Apartment apartment curated by Berlin-based gallerist, Michael Fuchs.